we really give a gift when we answer with deep attention. Miriam, thank you for a thoughtful comment about a poem simple on its surface, deeper in its intent. And this is why you and I became teachers. Sigh. Yes, among other reasons. I think you chose to become a teacher, undertaking the proper education for purpose of that accomplishment. I toppled into the field, and had to go back to get the education. Still, we’re both drawn to wanting to be part of empowering people with skills. BTW – My site (or maybe WordPress) identified your message as spam – It doesn’t understand the power of brevity. Absolutely. And remembering to be as forthright as very young children. Annika, I’m glad you “heard” the intended message. Thank you, Betty. Poetry is hard for me – I tend to write too much and it demands brevity. That’s interesting. I’ll have to think about this for a while. Fabulous observations, Shari! All too true, like “what I learned in kindergarten.” On a tragic note, I see more young moms walking with their children whether in or out of the stroller (or both, if more than one child) talking on their phones! When my mom used to walk with us she would tell us about the world around us. I wonder what children hear in those one-sided cell phone conversations, at ages where they do not totally comprehend language? You are so right: Children hear everything – listening long before they speak is how they learn to make sense of language and eventually to articulate speech and to communicate well. There are lots of studies about children and language development. Parents speaking and singing to their children, not just around them, is crucial. I read aloud to my sons when they were in utero – and they were both very early readers whose breadth and depth of language was so pronounced that strangers on the street would stop to listen to them talk – when they were just 2 and 3. All that phone texting and cell phone absorption is not good for kids – doesn’t take a survey to figure it out. Maybe you could slip this info to your students as they learn how to enjoy life around them. They could also think how they communicate with the rest of the world, one day perhaps with the most important people in their lives – their own children. I love that painting! And you’re so right about grown ups needing to speak less and listen more. These very early words and sentences we learn as children reflect what’s actually important in life. Isn’t the painting exquisite? I’ve always loved it – it says so much about sisters, family, childhood, beauty, and the quality of light he managed gives the scene an ethereal sense. This is how a master shows his skill. 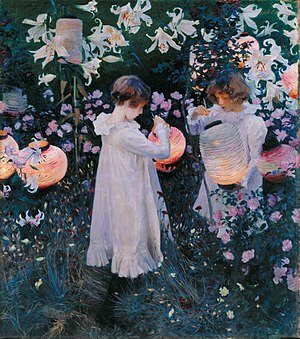 I’ve always loved Sargent’s art – they are alive. Me too, and Rubens as well. Aptly said Sharon. Those first words that a child learns and repeats are always rather interesting to see what are the first things that stick in their mind. Enough importance that they learn those words first. As a woman in Viet Nam once said to us “Stop talking. No more talking!! !” And to this day, it has become our mantra, so worth repeating. Valuable words. I’m pleased you understood this one, Peta. I’ve spent too many hours of my life trying to retract what I just said – If only I would not have spoken at all.